One of the great divides between Catholics and protestants (those who protest against the Catholic Church) is the role of Peter. 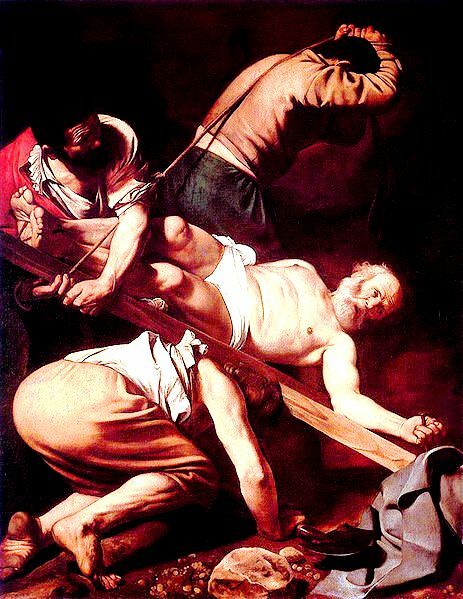 Catholics claim that Jesus himself made Peter his earthly successor as the leader of His newly created Church, while protestants believe that Peter was just another apostle. Let’s check out these claims using sacred scripture as our guide. In John 1:42, Jesus changes the Apostle Simon’s name to Cephas, or Peter, a name which means “Rock”. Now we know from scripture that Jesus is the Rock, or Cornerstone (1 Corinthians 10:4). Therefore, it can be assumed from this name change that Jesus is handing on to Peter what He Himself is, Rock. John 1:41-42: He first found his brother Simon, and said to him, "We have found the Messiah" (which means Christ). He brought him to Jesus. Jesus looked at him, and said, "So you are Simon the son of John? You shall be called Cephas" (which means Peter). The difference, of course, is that Jesus is “The Rock”, while Peter is “A Rock”. This changing of names follows a very important pattern in scripture – Abram (father) became Abraham (father of many nations). Jacob (He who grasps the heel) became Israel (Ruling with God) when his mission was changed when he become the father of 12 tribes of the nation of Israel. Notice carefully that Abraham and Jacob became leaders and fathers following their name change. A male name change in the bible indicates leadership and fatherhood. In Matthew 16:18, Jesus creates and builds His Church (not "churches") on Peter, the Rock. Notice also that even hell can't stop the everlasting existence of His Church. In the following verse 19, Jesus gives Peter the keys to the kingdom. And this shall be in that day: I will call my servant Eliakim, the son of Hilkiah. And I will clothe him with your vestment, and I will strengthen him with your belt, and I will give your authority to his hand. And he shall be like a father to the inhabitants of Jerusalem and to the house of Judah. 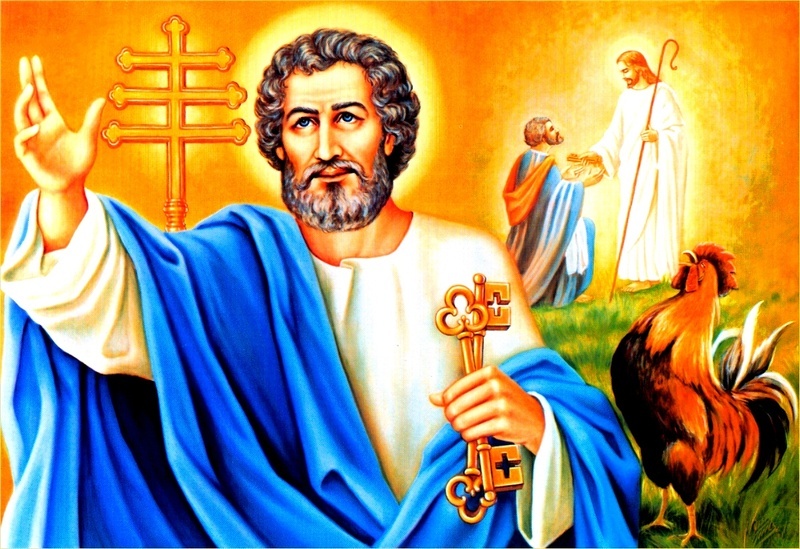 And I will place the key of the house of David upon his shoulder. And when he opens, no one will close. And when he closes, no one will open. And I will fasten him like a peg in a trustworthy place. And he will be upon a throne of glory in the house of his father. And they will suspend over him all the glory of his father’s house: various kinds of vessels and every little article, from the vessels of bowls even to every instrument of music. Modern day bible readers may not understand the meaning of what giving Peter the keys to the kingdom means, but the people who were actually there when Jesus said it understood it completely. The Old Testament parallel which they were all familiar with in Isaiah said that Eliakim would have the complete authority of King David, the ultimate great ruler of Israel. He would have his throne of glory while ruling in his place. Being a peg in a trustworthy place is akin to the center pole of a tent that holds up the entire tent. It has to stand tall and straight for the entire tent to stand up. And besides being a ruler, he would also be a father, or papa. Catholics refer to this “papa” figure as Pope. According to Matthew 16:19, Jesus said that Peter would have the power to bind and loose anything on earth, and Peter’s decision would also be bound and loosed in heaven. Most protestant churches do not believe in that kind of authority by any man on earth, but there it is, right there in the Bible. In Matthew 14:29, we learn that the only apostle to walk on water like Jesus was Peter! In John 21:15-17, Jesus directs Peter to feed his sheep. Then, when they had dined, Jesus said to Simon Peter, “Simon, son of John, do you love me more than these?” He said to him, “Yes, Lord, you know that I love you.” He said to him, “Feed my lambs.” He said to him again: “Simon, son of John, do you love me?” He said to him, “Yes, Lord, you know that I love you.” He said to him, “Feed my lambs.” He said to him a third time, “Simon, son of John, do you love me?” Peter was very grieved that he had asked him a third time, “Do you love me?” And so he said to him: “Lord, you know all things. You know that I love you.” He said to him, “Feed my sheep." Notice that Jesus tells this to Peter three times, the exact number of times that Peter denied him. The fact that Jesus told Peter this, and no other, indicates that Jesus considers Peter to be the leader of His Church on earth, not John, James, or Matthew. In Luke 22:31-32, Jesus tells Peter that satan wants to sift him like wheat. Notice satan didn’t ask for any other apostle to sift. Why? Because satan knows that if he gets the leader, the rest will scatter (remember how the Philistines scattered after David killed Goliath? Remember how the apostles took off after Jesus was captured in the Garden of Gethsemane? (And by the way, Satan is using that exact same method today; using church scandals with the leaders to make the rest of us flee The Church). Jesus then tells Peter that He has prayed for HIM, so that HIS faith will not fail, so that he can be completely converted, and then HE can strengthen the other apostles. Sounds like a leadership conference, doesn’t it? In John 20:3-6, the younger John and the older Peter both run to the tomb of Jesus to see for themselves if Christ had risen or not. The younger John gets there first, but deferring to his leader, does not go in, leaving that honor to Peter. "Peter then came out with the other disciple, and they went toward the tomb. They both ran, but the other disciple outran Peter and reached the tomb first; and stooping to look in, he saw the linen cloths lying there, but he did not go in. Then Simon Peter came, following him, and went into the tomb; he saw the linen cloths lying"
In Acts 1:15-26, a meeting is held to replace Judas, led by Peter. In those days, Peter, rising up in the midst of the brothers, said (now the crowd of men altogether was about one hundred and twenty): “Noble brothers, the Scripture must be fulfilled, which the Holy Spirit predicted by the mouth of David about Judas, who was the leader of those who apprehended Jesus. He had been numbered among us, and he was chosen by lot for this ministry. And this man certainly possessed an estate from the wages of iniquity, and so, having been hanged, he burst open in the middle and all his internal organs poured out. And this became known to all the inhabitants of Jerusalem, so that this field was called in their language, Akeldama, that is, ‘Field of Blood.’ For it has been written in the book of Psalms: ‘Let their dwelling place be desolate and may there be no one who dwells within it,’ and ‘Let another take his episcopate.’ Therefore, it is necessary that, out of these men who have been assembling with us throughout the entire time that the Lord Jesus went in and out among us, beginning from the baptism of John, until the day when he was taken up from us, one of these be made a witness with us of his Resurrection.” And they appointed two: Joseph, who was called Barsabbas, who was surnamed Justus, and Matthias. And praying, they said: “May you, O Lord, who knows the heart of everyone, reveal which one of these two you have chosen, to take a place in this ministry and apostleship, from which Judas prevaricated, so that he might go to his own place.” And they cast lots concerning them, and the lot fell upon Matthias. And he was numbered with the eleven Apostles. This is a proof text for apostolic succession, by the way. The leader of this meeting is none other than Peter. Matthias is chosen as the new 12th apostle. In Acts 2:14, at Pentecost, it is Peter preaching the sermon, after all of the apostles were empowered by the Holy Spirit. But Peter, standing up with the eleven, lifted up his voice, and he spoke to them: “Men of Judea, and all those who are staying in Jerusalem, let this be known to you, and incline your ears to my words." Later on, in Acts 3:6-8, the first post-Pentecost miracle is performed by Peter. But Peter said: “Silver and gold is not mine. But what I have, I give to you. In the name of Jesus Christ the Nazarene, rise up and walk.” And taking him by the right hand, he lifted him up. And immediately his legs and feet were strengthened. And leaping up, he stood and walked around. And he entered with them into the temple, walking and leaping and praising God. When Ananias and Sapphira lied about the money they were giving to the Church, in Acts 5:1-10, it was Peter who inflicted their punishment (death). But a certain man named Ananias, with his wife Sapphira, sold a field, and he was deceitful about the price of the field, with his wife’s consent. And bringing only part of it, he placed it at the feet of the Apostles. But Peter said: “Ananias, why has satan tempted your heart, so that you would lie to the Holy Spirit and be deceitful about the price of the land? Did it not belong to you while you retained it? And having sold it, was it not in your power? Why have you set this thing in your heart? You have not lied to men, but to God!” Then Ananias, upon hearing these words, fell down and expired. And a great fear overwhelmed all who heard of it. And the young men rose up and removed him; and carrying him out, they buried him. Then about the space of three hours passed, and his wife entered, not knowing what had happened. And Peter said to her, “Tell me, woman, if you sold the field for this amount?” And she said, “Yes, for that amount.” And Peter said to her: “Why have you agreed together to test the Spirit of the Lord? Behold, the feet of those who have buried your husband are at the door, and they shall carry you out!” Immediately, she fell down before his feet and expired. Then the young men entered and found her dead. And they carried her out and buried her next to her husband. When God decided that all foods were now okay to eat, God revealed it to Peter in a dream, Acts 10:9-16. The doing away with Kosher food dietary laws was a VERY big deal in Jewish culture. The fact that it was revealed to Peter indicates leadership. Then, on the following day, while they were making the journey and approaching the city, Peter ascended to the upper rooms, so that he might pray, at about the sixth hour. And since he was hungry, he wanted to enjoy some food. Then, as they were preparing it, an ecstasy of mind fell over him. And he saw heaven opened, and a certain container descending, as if a great linen sheet were let down, by its four corners, from heaven to earth, on which were all four-footed beasts, and the crawling things of the earth and the flying things of the air. And a voice came to him: “Rise up, Peter! Kill and eat.” But Peter said: “Far be it from me, lord. For I have never eaten anything common or unclean.” And the voice, again a second time to him: “What God has purified, you shall not call common.” Now this was done three times. And immediately the container was taken up to heaven. It was Peter who baptized the first Gentiles into His Church, in Acts 10:44-48. While Peter was still speaking these words, the Holy Spirit fell over all of those who were listening to the Word. And the faithful of the circumcision, who had arrived with Peter, were astonished that the grace of the Holy Spirit was also poured out upon the Gentiles. For they heard them speaking in tongues and magnifying God. Then Peter responded, “How could anyone prohibit water, so that those who have received the Holy Spirit would not be baptized, just as we also have been?” And he ordered them to be baptized in the name of the Lord Jesus Christ. Then they begged him to remain with them for some days. Whenever the list of Apostles is given it is always Peter who is listed first, in Matthew 10:2-4, Mark 3:16-19, Luke 6:14-16, and Acts 1:13. Now the names of the twelve Apostles are these: the First, Simon, who is called Peter, and Andrew his brother, James of Zebedee, and John his brother, Philip and Bartholomew, Thomas and Matthew the tax collector, and James of Alphaeus, and Thaddaeus, Simon the Canaanite, and Judas Iscariot, who also betrayed him. 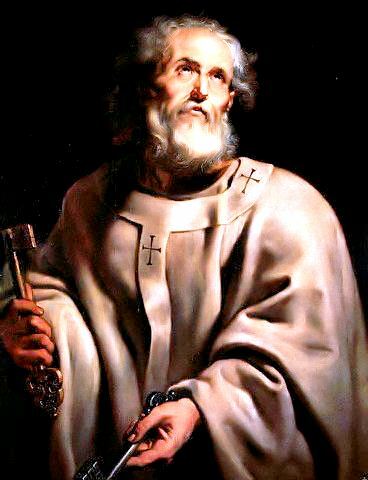 In Galatians 1:18, we learn that St. Paul, before beginning his public ministry, spent 15 days with Peter. Wouldn't you have loved to hear those conversations! Then after three years I went up to Jerusalem to visit Cephas, and remained with him fifteen days. So we see from the name change, the fact that Jesus gave Peter the keys to the kingdom and he had the power to bind and loose ANYTHING on earth which would also be ratified in heaven, the fact that Jesus told Peter to feed His sheep three times, the fact that Jesus prayed for Peter’s faith (rather than any other apostle) to be strong so that he could strengthen the others, the fact that John deferred to Peter to be the first to go into the tomb of Jesus, the fact that Peter led the meeting to replace Judas, the fact that Peter preached the first sermon following the miracle at Pentecost, the fact that Peter performed the first miracle after Pentecost, the fact that Peter meted out the punishment to Ananias and Saphira for lying to God, the fact that God revealed to Peter that the Jewish kosher food laws were done away with in the New Covenant, the fact that it was Peter who baptized the first Gentiles with the Holy Spirit, and the fact that it is ALWAYS Peter who is listed first in the list of apostles, that the Primacy of Peter is biblical indeed. Catholics see and believe this today, only Peter is now Pope Benedict XVI, who sits on the chair of Peter. In the Old Testament, there was the authoritarian Seat of Moses (Matthew 23:2), which was handed down to Joshua and subsequent Jewish leaders after Moses’ death. The New Testament Chair of Peter is directly analogous to the Old Testament Seat of Moses.